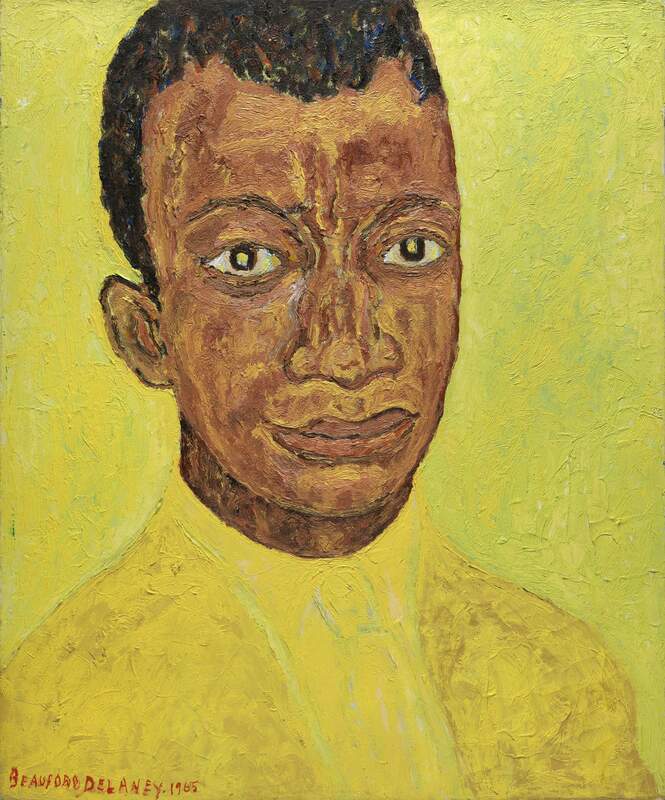 Beauford Delaney (American, 1901–1979), “Portrait of James Baldwin,” 1965, oil on canvas. Museum purchase, 2015. © Estate of Beauford Delaney, used by permission. NORFOLK, VA. — The Chrysler Museum of Art has added to its collection an iconic painting in the history of African American cultural and artistic achievement. The portrait depicting celebrated writer and activist James Baldwin (1924–1987) was painted by his close friend and mentor, artist Beauford Delaney (1901–1979). The Chrysler’s board of trustees voted unanimously on December 10, 2015, to purchase the powerful 1965 work. The 25-by-21-inch oil on canvas painting, previously held in a private collection, presents Baldwin’s face larger-than-life, set against a bold background of fluorescent yellow. The painting went on public view in January in the Chrysler’s Roberts Wing for American and European Art. It appears alongside other major works from the early and mid-Twentieth Century in Gallery 221. Though Delaney was born in Knoxville, Tenn., his family has Virginia roots. His maternal grandmother, Susan Johnson, was a free black born in Norfolk, and is thought to be a descendant of some of the first free black colonists on Virginia’s Eastern Shore. His mother, Delia Johnson Delaney, was born into slavery in Virginia in 1865 during the final weeks of the Civil War, and his father, the Reverend Samuel Delaney, a Methodist minister and barber, also was a native of the Commonwealth. Delaney was born into a large family that encouraged his (and his younger brother Joseph’s) early displays of artistic and musical talent. In the early 1920s, he moved to Boston and studied at the Massachusetts Normal School, the Copley Society and the South Boston School of Art. In 1929, the building cultural momentum of the Harlem Renaissance drew Delaney to New York City. There he met painters Jacob Lawrence and Romare Bearden, poets Langston Hughes and Countee Cullen and many other leading members of this vibrant community. Artistically, however, Delaney gravitated toward the avant-garde circle of modern artists led by Alfred Stieglitz, Georgia O’Keeffe, Stuart Davis and John Marin. He took classes at the Art Students League under Thomas Hart Benton and John Sloan, and he found work as a caretaker, porter and telephone operator at the fledgling Whitney Museum of American Art in Greenwich Village. Around 1940 friends encouraged the aspiring writer James Baldwin, still a high school student at the time, to introduce himself to Delaney. Thus began a lifelong friendship. Over the next three decades, Delaney created at least 10 portraits of Baldwin. Among them, the Chrysler’s 1965 oil painting is one of the largest and mostly highly finished. Deep blues, reds, and greens peek out from layers of brown paint in the face, revealing the rich variety within Delaney’s palette. But one color—fluorescent yellow—dominates the painting and Delaney’s work during the final decades of his career. Delaney renders the writer’s suit and tie, as well as the painting’s background, in blazing shades of incandescence. “I learned about light from Beauford Delaney, the light contained in every thing, in every surface, in every face,” James Baldwin wrote in 1965, the year of this portrait’s creation. To Delaney, bright swirls of yellow conveyed warmth, freedom, healing and redemption, comforting the artist during periods of poverty, depression and, late in his life, dementia. The painting’s debut at the Chrysler and a selection of free Sunday-afternoon Gallery Talks in February comprise the museum’s Black History Month programming. The Chrysler Museum of Art is at One Memorial Place. For information, www.chrysler.org or 757-664-6200.